You'll feel large and in charge of your binder when organizing documents with Write & Erase Big Tab™ Dividers. Tabs are 1.5x bigger than standard tabs for even more available writing space to enjoy. Made of sturdy paper, you can write, erase and reuse your dividers. Make easy changes at any time. 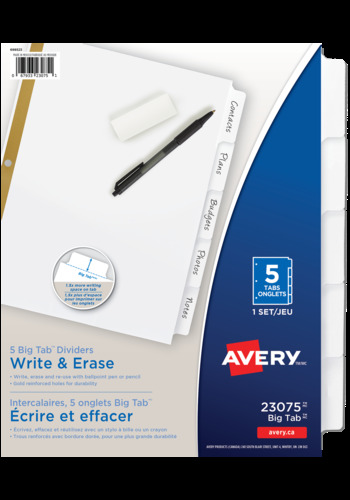 You'll feel large and in charge of your binder when organizing documents with Write & Erase Big Tab™ Dividers. Tabs are 1.5x bigger than standard tabs for even more available writing space to enjoy. Made of sturdy paper, you can write, erase and reuse your dividers. Make easy changes at any time. Use a pen or pencil to write on the white tabs quickly and conveniently. Write, erase and reuse with ease on the laminated tab surface. The dividers are reinforced to ensure the three pre-punched holes resist tearing in your binder for extra-durability. Enjoy the luxury and live large. Write-On Paper Dividers are perfect for when you want to keep up with organization but want the freedom to make changes and update documents.